With a stay at Myrtle Beach Resort Vacations in Myrtle Beach (South Myrtle Beach), you'll be a 5-minute drive from Big Laughs Theatre and 11 minutes from Myrtle Beach State Park. This beach condominium resort is 3.7 mi (6 km) from The Market Common and 5.4 mi (8.7 km) from Family Kingdom Amusement Park. Make yourself at home in one of the 1000 air-conditioned rooms featuring kitchens with full-sized refrigerators/freezers and ovens. Rooms have private balconies or patios. Complimentary wireless Internet access keeps you connected, and cable programming is available for your entertainment. Conveniences include microwaves and coffee/tea makers, as well as phones with free local calls. Make a splash in one of the 2 indoor and 4 outdoor swimming pools and enjoy other recreational amenities, which include a complimentary water park. Additional amenities at this condominium resort include an arcade/game room, gift shops/newsstands, and a picnic area. Enjoy American cuisine at The Portside Pub & Galley, a beachfront restaurant which features a bar and an ocean view. Wrap up your day with a drink at the beach bar. Featured amenities include express check-out, laundry facilities, and ATM/banking services. Free self parking is available onsite. 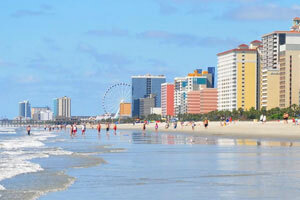 The preferred airport for Myrtle Beach Resort Vacations is Myrtle Beach, SC (MYR). Minimum Spring Break check-in age is 23 years old.